According to Instagram, National Cheese Day was June 4th. This girl doesn’t need to be told twice to celebrate a fake holiday dedicated to cheese 🙂 Throwing a cheese board together is definitely one of the easiest ways to play hostess with the mostest because there are really no rules. My “expertise” comes solely from subsisting on bread and cheese in Switzerland, but here’s my guide to assembling a winning cheese board! Cutting boards, cheese boards, carving boards, serving boards etc. come in all sorts of shapes and sizes. My mom picked up this adorable fish-shaped board at an artisan craft fair in Providence, Rhode Island a few weeks ago and I couldn’t wait to put it to use. If you don’t have one laying around, my favorite place to buy kitchen stuff is TJ Maxx/Marshall’s/Home Goods*. There are so many fun gadgets at such a steal, it’s hard to not walk out with a million things I don’t need! 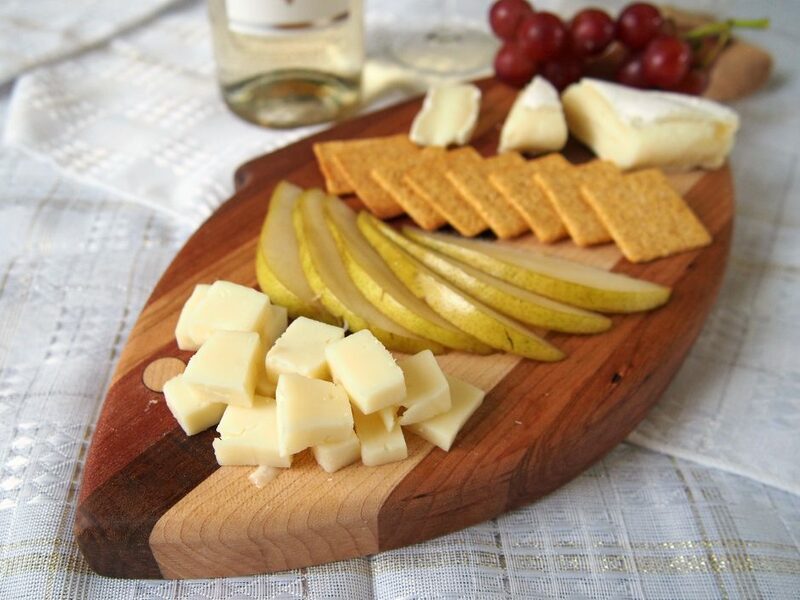 A wooden serving board is so essential for beautiful presentation of just about anything – just make sure it’s big enough to fit your different elements without crowding them. I try to avoid having too many similar colors or textures right next to each other when arranging, but otherwise it’s whatever floats your boat. Go with what you love, but in general try to have a balance of soft/mild cheese (i.e. brie, camembert, mozzarella, etc.) and hard/flavorful cheeses (i.e. gouda, cheddar, Gruyere, etc.). Brie is my first love and no cheese board would be complete without a brie for me! I intended to go with a brie and a gouda for this board, but Trader Joe’s had samples out of their semi-soft Italian Formaggio Lagorai and I loved it. I read somewhere to have “Something old, something new, something goat, and something blue” but honestly, rules are made to be broken – I don’t like blue cheese at all and tend to stay away from stinkier cheeses! To go with that, it would be smart to include at least one familiar cheese when serving a crowd. How much cheese? This will vary greatly based on what kind of event you’re hosting but in general, 3-4 oz. per person should do. Serve cheese at room temperature and try to keep the stronger cheese away from the mild ones so the odor doesn’t transfer over. For presentation purposes, definitely slice/cube your cheeses before serving and stay away from prepackaged deli slices. Don’t forget to set out separate spreaders for your super soft cheeses. 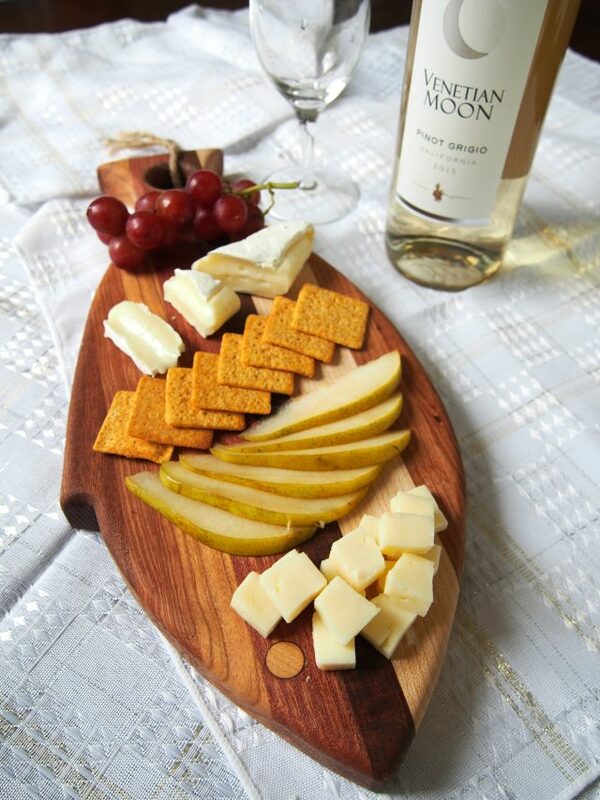 Cheese is great by itself, but something to eat it with is key for a cheese board! I’ve been trying to eat pretty low-carb (LOL) this summer, so I went with what we had at home instead of buying bread. In general, crackers that aren’t packed with flavor are better so they don’t overpower the cheese. Thin slices of crusty bread, mini baguettes, mild crackers in different shapes, etc. are all great. You can also serve toasted nuts. Fresh fruit and fruit spreads like compote/preserves/chutney all pair well with cheese. Off the top of my head, fresh fruits that go well include thinly sliced apples, pears, grapes, and olives. Fruit is a great way to add some visual variance to your board, so be creative and don’t be afraid to use whatever you already have in your kitchen! Some of my favorite sweet extras include honey and fig spreads. 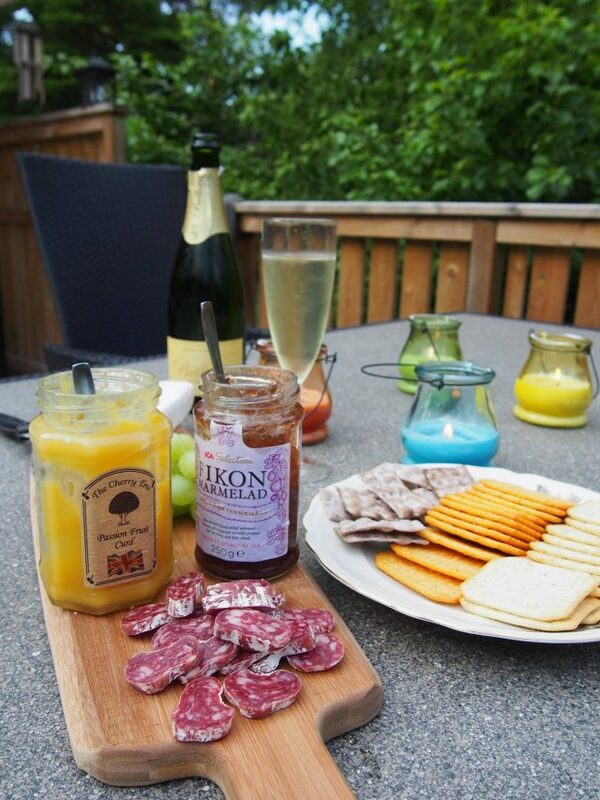 Enjoying a spread of meats and cheeses (and Spanish cava) at my friend’s summer home in Sweden. Prosciutto, salami, pepperoni, whatever. I’m not a big meat eater and didn’t want to buy anything for this board, but preserved meats are another savory extra often served with cheese platters. Remember, you can’t really go wrong so don’t feel like you have to break the bank for a Pinterest-perfect cheese platter. Seek help. Just kidding. I did ask the wine guy at Trader Joe’s* for suggestions, but I love a crisp white to go with anything cheesy – fondue, pasta, cheese platter. In Switzerland, they told us fendant/chasselas (a regional wine) is necessary with fondue for digestion – can’t complain 😉 In my opinion you also can never go wrong with something sparkling, but that may be a product of having traveled through Europe where bubbles aren’t reserved for special occasions like they seem to be in the States. That’s it! Cheese boards are the best secret to easy entertaining – delicious, classy, and photogenic (read: Instagrammable for girls’ night) so have fun and enjoy 🙂 What are your favorite cheeses or sweet/savory sides to see on a cheese board? Do you have a favorite wine pairing? Let me know in the comments!